ALOHA, Ore. — Washington County Sheriff’s Office tactical officers raided three locations and arrested several  people in connection with a major drug investigation Tuesday. Detectives said the suspects stole people’s identities, created fake profiles and used a website called “Silk Road” to sell methamphetamine around the world in an online drug trafficking ring they operated from Aloha. A federal indictment said the suspects transported more than $500,000 in meth. According to investigators, the drugs were shipped through FedEx and the U.S. Postal Service. …”This is a very complex investigation that has taken us a year to investigate because we are dealing with Internet crimes and when the Internet is involved, people are using computer names,” said Sgt. Bob Ray with the Washington County Sheriff’s Office. “It’s very difficult, it’s a long process.” …Washington County detectives said they expect to make more arrests as the investigation continues. They are currently searching for suspect Donald Bechan, 39, who is shown in photo at left. 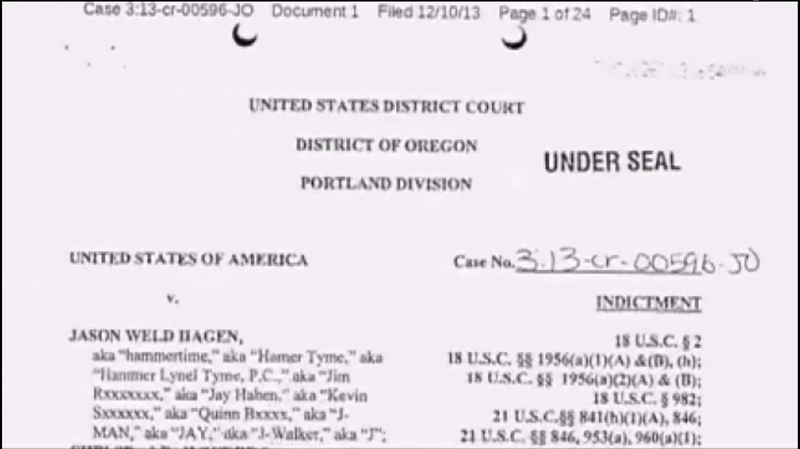 The group is identified as the seller “hammertime” in the federal indictment; the indictment (3:13-cr-00596b-J0) is not yet available through PACER (likely tomorrow), but the news video segment featured a screenshot of the first page identifying hammertime.